During 1999, Caryl and I flew to New Mexico on vacation to see it for ourselves after reading many colorful brochures. After driving around and staying in Albuquerque, Santa Fe and Taos, we can only say we still feel nothing beats the great Northwest. The highlight of the trip was meeting several wonderful, dedicated individuals involved in animal protection in a state we were told leads the nation in animal cruelty cases. We stopped at the Santa Fe Humane Society and were impressed by their friendliness and professionalism, as well as the cleanliness of the facility and, most importantly, the care the animals received. We asked if they had any Great Pyrenees and explained we had rescued several through the years from private parties, humane societies and a Kansas puppy mill. They informed us they and other rescue groups occasionally got them in due to the sheep population in the state where they are used for predator control. They further stated as a matter of policy they did not allow out of state adoptions. We told them to please call us before they ever put down a Great Pyrenees as we had excellent references in rescuing this difficult breed and sent them our references upon returning home. Several months later, we were surprised to learn they had contacted all our references including our veterinarians and had done the most thorough background check of any humane society we had ever encountered. We then received a phone call from them and they explained they had a three or four year old Pyrenees named Maxwell who had been severely neglected and abused. None of their male personnel which included their vets could get near him. Several female staff members were attached to him and didn’t want him euthanized. We agreed to take him sight unseen but couldn’t drive to New Mexico to pick him up. Due to the August heat and a connecting flight to Seattle, we agreed that he would be flown to Salt Lake City where I would meet him and drive him back. I drove to Salt Lake City on an agreed upon date and flight only to learn he couldn’t be transported until the next day on a 10:00 p.m. evening flight. I arrived at the cargo hold facility which was next to the runways with incredible noise from jets landing and departing. An employee brought the dog carrier out on a pallet and I peeked inside to see a fearful face of white and buff looking straight back at me. I opened the carrier door slowly and grabbed the leash as he bolted out and desperately fought to escape. If the humane society had not put a tight collar on him, he would have been long gone. I must confess, I was somewhat taken aback by his presence. He was very skinny with his ribs protruding and uncontrollable with a fierce wolf-like muzzle. He was terrified of the noise and immediately jumped into the open side door of my van. I drove to the motel next to the airport where I tried to walk Maxwell on the leash. He didn’t try to escape but after an hour of walking he still would not let me near him. I opened the motel door and he quickly entered in front of me. I had previously bought a fully-cooked rotisserie chicken, boned it out and set it next to a full quart of cottage cheese. I moved them as far away from my bed as possible and watched Maxwell out of the corner of my eye. He cautiously approached the meal and greedily consumed it in a matter of minutes. The next morning, I left early and, after an hour of driving, turned off on a desert road with a road crew a short distance away. Maxwell immediately pulled on the leash, nose to the ground, moving to cover as much ground as possible looking for anything that moved. This was familiar territory to Maxwell who had managed to survive living off the land. He presently weighed 70 lbs. when his normal weight should have been in the range of 125 to 150. As we headed back to the van, the road crew approached in our direction. Maxwell growled menacingly and I knew the bonding had begun. Every day driving for eight hours Maxwell never once laid down but stood next to me with a worried look. I know he wondered where he was going, what fate lay before him, as he left the sweet smells of the desert air behind him and the only life he knew. Every day he feasted on the same menu of a full chicken and a quart of cottage cheese and left no scraps. We finally drove over the high barren hills outside of Yakima into the valley below and quickly started up Snoqualmie Pass. Maxwell stared out the window seeing for the first time everything covered in trees and fast approaching the largest city he had ever seen. I drove Maxwell to our Edmonds home and introduced him to our three other rescued Great Pyrenees, Emma, Aspen and Charlie. Maxwell began the slow process of adjusting to his new surroundings and overcoming his shyness. He began to spend less time under the kitchen table and began to follow us around the house and his tail was no longer tucked between his legs. His bark would return later. Maxwell filled out quickly and looked sleek. He never was the biggest nor the strongest compared to the others, but simply born to lead. After several fights, he was seldom challenged and we could never have imagined that this unlikely star would rise and reign as the leader over Emma, Aspen, Charlie, Annie, Sunny, Barkley, Buddy, Harley (Saint Bernard) and Buster (Saint Bernard) for the rest of his life. The same leadership qualities we hold in high esteem in the human species were on full display in Maxwell. Above all, he was loyal, super protective, admired and respected by his pack and his human counterparts and avoided contact with anyone else. Maxwell separated himself from his pack with his incredible speed and endurance. He was light-footed and when he played he would lower his rump almost to the ground and pivot on either foot, instantly changing direction so no other dog could catch up with him. He also operated on a higher level of consciousness than the others and related to his human family as one of them. Maxwell had keen insight into the personalities and behaviors of Ralph, Caryl and Lisa which made it uncomfortable to quarrel around him or communicate at times because he seemed to understand much of the conversation. Max sensed Lisa was the most vulnerable and, when she was home, he slept downstairs by her bedside. On one incident, Lisa and her boyfriend got out of the car and were standing close together. Max had never seen a male this close to his Lisa and ran toward them biting her boyfriend several times before he could be restrained. Maxwell was incredibly close to Caryl who he knew had a deep caring nature and he could always count on for comfort. During any kind of sickness, whether it be a migraine or chemotherapy, he could be found lying next to her bedside. On hikes or at off-leash dog parks, Max was always vigilant looking back with a worried look as his pack moved ahead of him while he stayed back for Caryl to catch up never letting her out of his sight. Ralph represented freedom and adventure for Max and the pack as they disappeared on hikes into two national forests. Later, the pack would return separately or in pairs to the campsite. 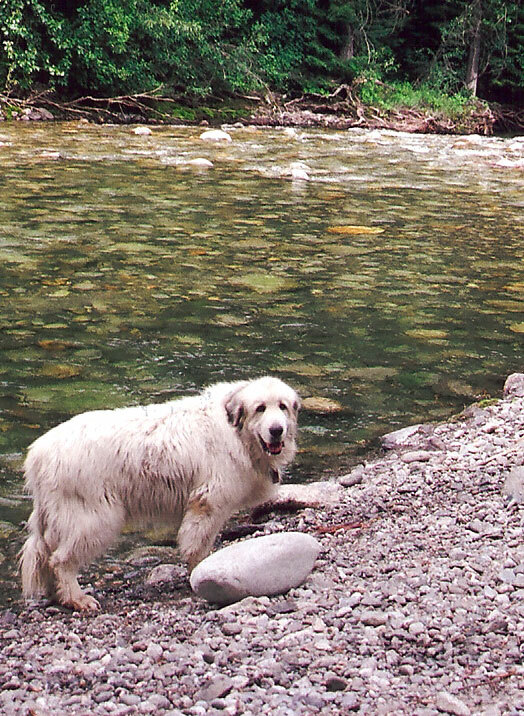 Max, however, would never return to the campsite until he located Ralph who was resting down some unmarked trail by the river. Max would arrive with his muzzle pulled back, tail wagging, teeth protruding into a smile, and plant kisses on his face. Max had an inherent responsibility over his pack which was heightened at busy off-leash dog parks. If a four-legged intruder became too playful or aggressive with one of the pack, he would immediately confront it with a stare down and growl or fight the outsider until he backed away. This protection also carried over to Lisa’s little Lhasa Apso, Nutmeg, even though she was not one of his pack. Countless times on the beach when Maxwell wanted to bring the pack together he would drop down, roll over, with his legs straight up in the air. This was a sign for the entire pack to rush toward him, converge on top of him tails wagging, gently biting him all over uttering bravado growls. He would then roll over, stand up and playtime would be over and the rest would follow him to wherever he was headed. As the years passed, Maxwell had to have operations on both knees due to cruciate ligament damage. Afterward, he could still outrun every one of the pack but never again could he instantly cut, pivot and change directions as before. When Maxwell barked, compared to the others, it was a serious alert and all would follow him along the fence lines or pasture in pursuit of real or perceived predators. When he laid down to rest, he could always count on Sunny or Buddy to be at his side as they idolized their leader. There was a wild, untamed side to Maxwell that never changed and was difficult to reconcile with running an animal sanctuary. Buried deep within was a primordial flame to hunt when he no longer needed to that could never be extinguished. Maxwell spent long periods of time digging in sod in pursuit of field mice to eat while pack members looked puzzled and kept their distance. On one occasion, he caught a wild grouse and ate it feathers and all. Sadly, during his last years at the sanctuary, he managed to down two deer and devour parts of them. It was difficult to comprehend why the deer would jump into the fenced dog enclosure given the pack’s incessant barking and patrolling it, day and night. One late afternoon, November 24, 2008, the pack had been fed and preparations were being made to spend Thanksgiving the following day with Caryl and Lisa in Edmonds as Caryl had just gotten out of the hospital after surgery. Maxwell was the only dog allowed to go and the side door of the van was opened for him. He watched but didn’t get up eager to go which was highly unusual. He had to be coaxed to get in as he appeared to not be feeling well. Later that evening, Lisa and I decided to take him to the Lynnwood emergency clinic as a precaution. Maxwell walked in, laid down and had to wait for hours before he could be seen. When his turn came, he could not get up and had to be wheeled away on a stretcher to determine the cause of his illness. Hours later, a veterinarian informed us he was stabilized but the outcome looked grim and it appeared he had vascular cancer. As he was sedated, she asked if we wanted him euthanized. We were in shock, couldn’t comprehend the suddenness of it all and asked if we had any alternatives. She said they could keep him overnight, give him a blood transfusion and an ultrasound to determine if it was cancer and if it had spread. On Thanksgiving morning we went to the emergency center and a vet informed us that Max had several cancerous tumors next to vital organs and one had burst, spilling blood which was the reason he couldn’t get up when it was time to see him. She said, if another tumor burst, the symptoms would be identical and he wouldn’t be able to rise again but would slowly die. We asked if he would suffer and feel a lot of pain and were told he would weaken, have symptoms similar to anemia and pass away. She further stated, in good conscience, it was too risky to operate and he could very well die at any time before he got back to Sequim. Maxwell was brought out to the waiting room, wagging his tail and couldn’t wait to leave. He jumped in the van and seemed almost normal. We decided to give him a chance and, if he died on the way, at least he would be near our cemetery for burial. After seeing Caryl one more time and tearful goodbyes, Max and I started back to Sequim. I prayed he would live long enough to see his pack who anxiously awaited his return. I stopped halfway at Port Gamble to check on Max. He was alive, although he was not standing in his normal position but lying down. We arrived home to the pack’s joyous barking, put up the ramp and Max walked down surrounded by whimpers, wagging tails, licks and curious sniffs as to where he had been. The next day, I built a casket in anticipation of the fateful day we knew was not far off and called a backhoe operator to dig his grave. Weeks passed, then December, January and Maxwell seemed to be his old self running and leading the pack along the fence lines, excited over one snowfall after another and barking through the night. Some days, Max ate his meal quickly and other days he would skip it which made it difficult to monitor his condition to know when to end his life. We knew full well he would fight to live until his last breath. Max was given all the foods he liked which any pack member would dream to eat. He feasted on liverwurst, cooked chicken, scrambled eggs and plain cheeseburgers as well as his kibble which he conveniently left. On February 6 and 7, Maxwell began lying by himself under a large cedar tree where he had a good view of the livestock and wandering deer on a far hillside. It was as if he wanted to be alone and knew he couldn’t lead anymore. He seemed less interested in his gourmet dinners and it was difficult to determine if he was eating much or if one of his pack had eaten his meal by morning. On February 8, I decided to give him a bowl of vanilla ice cream which he could never resist. I thought, if he wouldn’t eat it, it was time to call the vet. He stared at the bowl for a while and then began to lick it all up. It seemed reassuring that he felt well enough to continue living. On the afternoon of February 9, Maxwell had moved and was lying closer to the pack on frozen ground. Snow was predicted and I had to go to town to stock up on supplies. On the way back, climbing up to the property, the snow fell heavily. I unloaded bags of grain in the lower barn and drove up to the house. As I walked along the side of the house, I saw Max lying next to the basement door, partially covered by snow. I immediately knew he had died. A beautiful part of our pack (human and dog) was gone and with him special memories we all shared. Lisa always said Maxwell reminded her of her grandfather who was always there for her to protect and comfort her. Caryl and Max seemed to connect on a spiritual level. He knew her thoughts and was closer to her than some of her human companions. To Ralph, he was a guiding light that always led the way. Only a few hours of light remained and I put a bed of alfalfa in the casket with a blanket. I used the forks of the tractor to bring it to where Maxwell lay. As the pack watched, I lifted his limp lukewarm body and placed it in the casket and covered it with the blanket. Several of the pack went to where he had died, could smell death and circled around his outline in the snow. Maxwell was taken up the hill to the sanctuary cemetery. By now, the snow was falling horizontally in blizzard conditions and sticking to whatever stopped it. It began piling up on the sides of the pack members as they watched the lid being nailed to the casket, lowered into the ground and covered with dirt and snow. Maxwell was now warm and safe from the storm and laid to rest next to his lifelong companions, Charlie and Annie. That evening the pack finished the last of Max’s special food and his favorite Trader Joe’s treats. The strength and unity of the pack died with Maxwell and will remain splintered as he was one of a kind and impossible to replace. We can only look back to a magical time while he was alive. So many memories are buried with him. Tears still flow at inappropriate times, driving, entering stores and private moments as the essence of Maxwell will never fade. It is now the middle of March and deer are visible feeding on new grass above patches of snow. Crocus, daffodils and tulips have pushed through frozen ground and new life is budding everywhere. The chorus sounds of frogs have begun. New rescues will occur and they will be reborn and have a glorious new life at Precious Life Animal Sanctuary, but never, never will there be another Maxwell. Precious Life Animal Sanctuary is a 501(c)(3) non-profit animal sanctuary located near Seattle, outside Sequim WA. A safe home for animals who have suffered from cruelty and neglect.